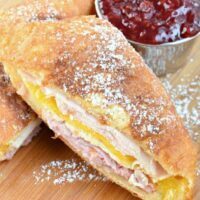 Looking for an old fashioned Monte Cristo Sandwich recipe? I’ve got the perfect solution! This month marks the 18th anniverary of my first date with my dear husband! Both of us were servers (that’s what we called ourselves…never waiter/waitress) at a local Bennigan’s restaurant. So many fun memories of working there, but many of my memories of Bennigan’s revolve around the food. Especially their Monte Cristo sandwich. Yum. You take a perfectly healthy turkey and ham sandwich, batter it up, deep fry it, coat it in powdered sugar, dip it raspberry jam, and wonder why America is obese. Actually this week my kids all had their yearly physicals, and two of them are underweight (the two oldest). What??? Have you seen what kind of food I cook and bake? I let them eat, honest! 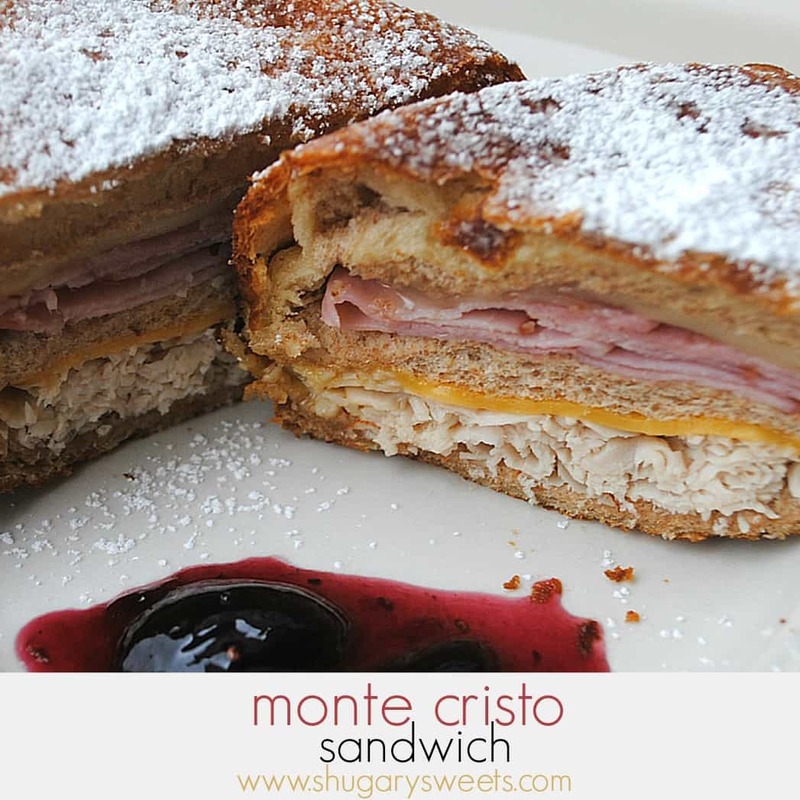 So, I guess you can say, the Monte Cristo is just what the doctor ordered! Stack three slices of bread on top of each other and cut off crusts on all four sides. Repeat for remaining 5 sandwiches. On first slice of bread, layer turkey with one slice of American cheese. Top with a slice of bread, a layer of ham and one slice of provolone cheese. Complete the sandwich with a slice of bread. Repeat for remaining 5 sandwiches. On lightly floured surface, open one package of Crescent rolls. Stretch and roll the dough until it is nearly twice the size. Cut 3 strips from the dough. Wrap one sandwich in one strip of dough. Wet fingertips to wet the seams and pinch them together. Repeat with last two strips, then repeat with second package of dough until all 6 sandwiches are covered. In large skillet, heat canola oil (about 1 inch deep) until very hot (sprinkle of flour should make it sizzle). Working 3 sandwiches at a time, place them flat side down in oil. They should brown in 1-2 minutes. Flip all sandwiches until all sides are browned. Remove from oil and repeat for remaining sandwiches. While sandwiches are hot, sprinkle with powdered sugar, serve and dip in raspberry jam. Enjoy! I love monte cristos. They’re like the perfect sandwich for breakfast, lunch or dinner. I like dipping mine in jam too! I tried the web and your site didn’t come up today. Hi Aimee, this is such a treat.Thank you for sharing.My children will really love this. This is one of my favorite sandwiches. My son too! Yours looks fantastic. Great job. 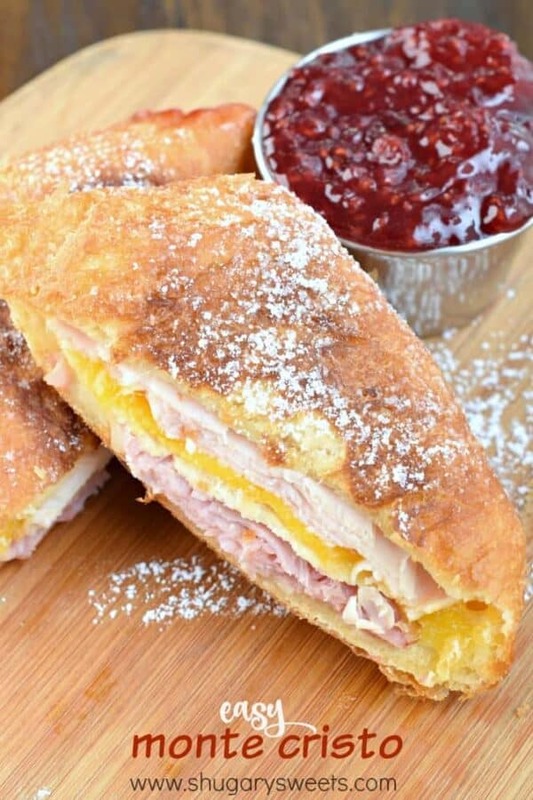 A Monte Cristo is one of my favorite sandwiches and your recipe looks great! Thank you for sharing with Full Plate Thursday! love, Love, LOVE! thank you for sharing with tuesday night supper club. Possibly my favorite sandwich in the world. Bennigan’s makes the best. I tried their copy cat at home! Whoa – I think I will leave the batter frying to the experts. Your crescent roll version has me intrigued though. Suzy, You MUST try the crescent roll. Way easier than batter, and absolutely delish. Honest. I worked there. Remember. It works! Haha!! very small world! Where did you work? Ours was in South suburbs of Chicago! We worked a the Bennigan’s in Albuquerque, NM…..still miss that place! I have had this sandwitch at a place called Cheddars in Omaha Ne. It is FABULOUS! also comes with raspberry jam. The serving size is so big that it will make two meals. It warms up beautifully in a low degree oven. 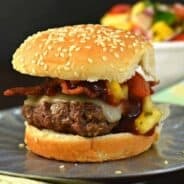 I love the sandwitch, I might have to try this recipe tho and see if it as good as Cheddars. I will try this !!!!!!!!!!!! 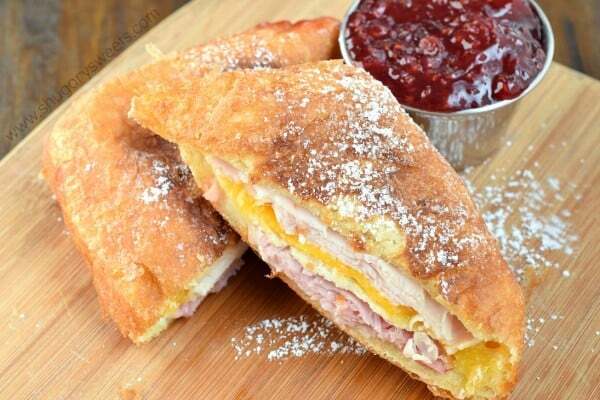 You probably could bake them, but you would lose the texture of a Monte Cristo, which is the crunchy fried coating! Thank you for posting this! 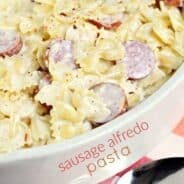 My hubby and I loved to eat these while we were dating and first married. Then the Bennigan’s closed and no more Monte Cristos. I’m not sure how to use the crescent rolls…how thick should the strips be? Hey Michelle, you want to press the dough out until it’s almost twice as big. Then cut each roll into 3 even pieces. You want them big enough to stretch around the sandwich. Hope that helps!! 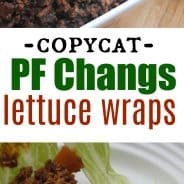 Made these this evening–YUM! They turned out great! Much easier and better than other attempts with a batter. Thanks!